Book 2 – Schubert series. Other book in series – Every Witch Way. A meddling cat sounds an odd focus for a christmas story but this just works, I love Schubert the cat and I am definitely not a cat lover! This book takes you away from the dark nights and the cold and makes you smile all the way through, its such a fun festive read with a great storyline too about Hugo and Isla and if they can both let go of their past to find a festive romance. A lovely read. A wonderful festive read. Loved Isla and Hugo’s characters. Animals in novels don’t always work, but there was something otherworldly about Schubert and the wayward feline added a touch of comedy to the story. I liked the way the story was worked from both Hugo and Isla’s viewpoints. It was a light, sweet romance with definite Christmas sparkle. I think I already guessed when both Hugo and Isla were out looking for Schubert and saw the police cars that Schubert had taken care of Griffin. He was a thoroughly nasty character but apart from the confrontation in the restaurant he didn’t feature directly which for me kept the balance of the story just right. 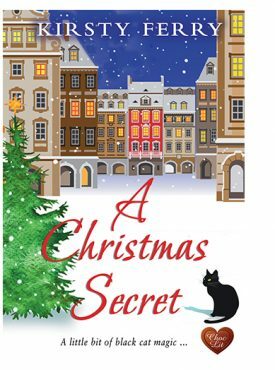 Cats and Christmas equals a magical combination in this heart-warming novella. I loved this story of Hugo, who has a bit of a troubled past and Isla who takes photographs of pets for a living and the wonderful cat Schubert, the real star of the story. Isla had a nasty break up with her ex and it’s left her wary of getting involved with anyone, until that is she meets Hugo and despite trying to resist, knows she is falling for him. This is a wonderful story, told from both points of view, of how their relationships develops on the lead up to Christmas and how their fledgling relationship is broken by someone from their past. Schubert the cat however has other ideas and will do everything in his cat power to get things back on track. Whether you are a cat lover or not this is a fabulous feel good story to get you into the Christmas spirit, full of emotion and humour and I would definitely recommend it. Love Christmas? Like cats? Adore romances? This is the book for you. Add it to your Christmas wish list now, or better still buy it yourself immediately! This is a smashing story of Annie and Hugo whose Christmas romance is carefully handled by the very capable Schubert, who appears to have magical properties, that is unless you know cats in which case you know it is their natural gift! The story takes in all the normal problems that the couple encounter but played out on a Christmas background. Chocolate to hand and enjoy your read. Another whimsical little story from Kirsty Ferry, a sort of sequel to Every Witch Way, but certainly readable as a stand alone. Isla has her own little business in Edinburgh, pet grooming and photography, and Hugo wants to get pics of his sister’s cat as a Christmas present. But Schubert is not an ordinary cat …. He appears to be telepathic, and speaks English, with a mind and ideas of his own. (Talks to his owner, Nessa, on the phone!) Hugo was something of a tearaway in his youth and it comes back to bite him when he is out with Isla for the first time and her ex butts in. Enter Schubert …. Most enjoyable read, thanks Kirsty, I’m always happy to see another of your works. A lighthearted read and particularly for anyone who has a pet that understands every word spoken to it. Hugo is caring for his eccentric sister’s cat Schubert that is able to understand human speech and even read minds. When Hugo takes Schubert for a cat portrait as an amusing Christmas present for his sister, he meets the lovely Isla who runs the pet shop. On Christmas Eve, Schubert escapes Hugo’s cat sitting care and leads Hugo and Isla on a madcap chase through the snowy streets of Edinburgh. Finally at the very end of the book, the reasons for this clever moggie’s antics are revealed. A fun read for an evening at home, with or without a cat for company. If you are looking for a Christmas story that is and romantic and funny, no need to look any further. It was very nice meeting up again with certain 2 legged and 4 pawed characters from the previous book. I liked the story behind Hugo, Griffin and Isla. I liked the way Nessa communicates with her cat. It made me smile and sometimes even laugh out loud. Sometimes it needs a little divine intervention to make 2 people see what the rest of the world already saw, but sometimes a little feline intervention can do the trick as well. A lovely, heartwarming story in a freezing setting. 4 stars. Thank you, Kirsty Ferry and Choc Lit.